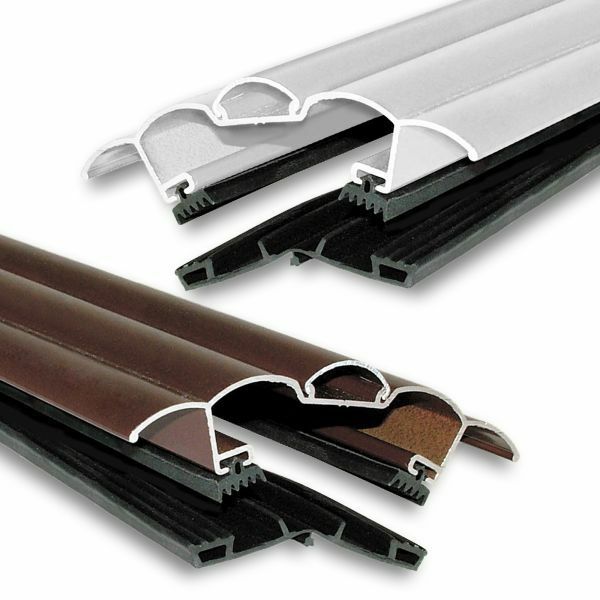 Product information "Sunwood Screw-Down Glazing Hip Bar"
Attractive and strong aluminium extrusion with tough powder-coated finish and long-lasting EPDM rubber gaskets. Part of the high quality, maintenance-free, Sunwood Timber Glazing System. This Screw-Down rafter hip bar includes powder-coated aluminium Rafter Hip Bar Top Cap with detachable Cover Cap to conseal and protect fixings. Rafter Hip Bar incorporates integrated High Side EPDM Rubber Gasket for water-tight seal against top side of glazing and a separate EPDM Base Gasket (with removable central pip) that is fixed to timber hip rafters to act as a seat and seal on the underside of glazing. These Screw-Down Rafter Hip Bars should be used when fitting to hip spars of Edwardian (4-sided) and Victorian (5-sided) conservatories. The exception to this is Victorian conservatories that have a front roof pitch equal to the side pitch, which can use the standard Screw-Down Rafter Main Bars. Note that on a roof using the Sunwood Rafter Hip Bars, the Plastic Spider Top Cap should be used in favour of the aluminium cast Sunwood Spider. This allows the profile of any hip and main bars to be cut from the Spider and the Spider sit properly on the ridge. Retro-fitted to hip rafters of existing 5-40° pitched timber roofs, these Rafter Hip Bar and other Sunwood components can encase and seal problem leak areas while also breathing a new lease of life into the roof. Sunwood is equally effective on new instalations too, offering an attractive, low-maintenance, long-life capping solution. Base Gaskets should be fitted to timber rafter. If timbers do not have a 3mm groove, then the central Pip that runs down the underside of the Base Gasket can be removed. Base Gasket should be cut to a length that allows it to over hand the gutter and fixed to the rafter with staples or similar. End Caps should be fitted and the Hip Bars cut to length before being screwed down onto the timber rafters at 300mm intervals. This will form a nice tight seal of the High Side EPDM Gasket onto the roof material. The Cover Cap is easy to fit using the two cover cap locators that run parallel down the length of the Hip Bar - just hook the Cover Cap over one cover cap locators and pivot down onto other for a tight snap fit. The above is a summary only and not intended as comprehensive fitting instructions. Related links to "Sunwood Screw-Down Glazing Hip Bar"
Customer review for "Sunwood Screw-Down Glazing Hip Bar"